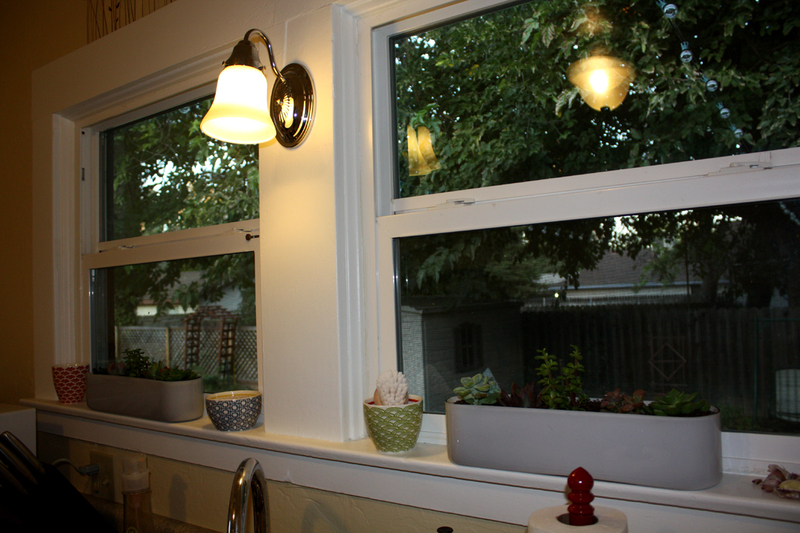 For a while now I have thought the windowsills above our sink in the kitchen would be the perfect space for plants. 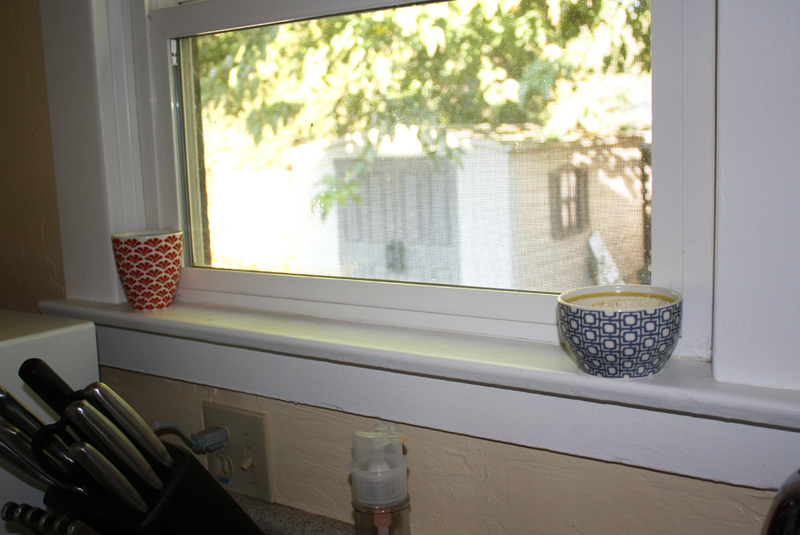 I've been so envious of my mom's kitchen sill with her ever-blooming orchids! The problem we ran across was our sill was somewhat narrow, and because we like to open the windows every night to cool the house down we needed plants that would not get in the way or get knocked off. On many visits to garden stores or Home Depot I would think I finally found the perfect planter, I would hold it up with excitement to show Brian only for him to dash my dreams and say it was too wide :o( But on one recent shopping trip we were triumphant, I think Brian actually spotted them, the perfect planters at Ikea! Here is a picture of our windowsill before in all it's nakedness. 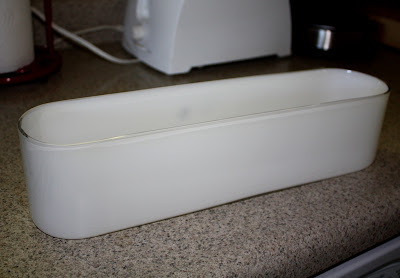 I had found a few vases at the thrift store a while back that I use for corralling our dish and veggie washing brushes. And my stash of garlic I have yet to plant in our garden. Here's a picture of the windowsill we were trying to find a vase to fit. Not extremely skinny, but skinny enough I had a hard time finding a planter. 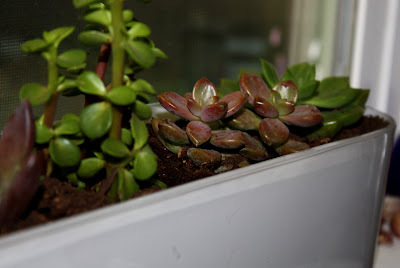 We still plan on putting some stay-put adhesive on the bottom of the planters to help prevent any plant spilling incidents. And finally, our lovely planters! They are simple, white, glass planters; they may actually be candleholders but they fit PERFECTLY on our sills! I had thought a herb garden would be nice, but herbs can grow rather tall and bushy. 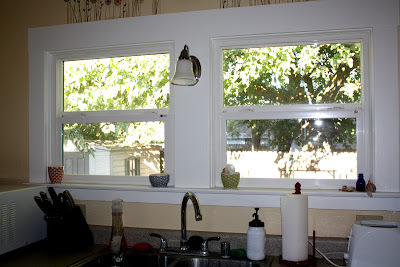 I could just imagine my frustration trying to wrangle the herbs so I wouldn't smash them while closing the windows. My next thought was a succulent garden. The growth is slower and if I forget to water them like I do with most my other indoor plants, they can probably tolerate it. We found several mini succulent plants at Home Depot and OSH in different shapes and colors. 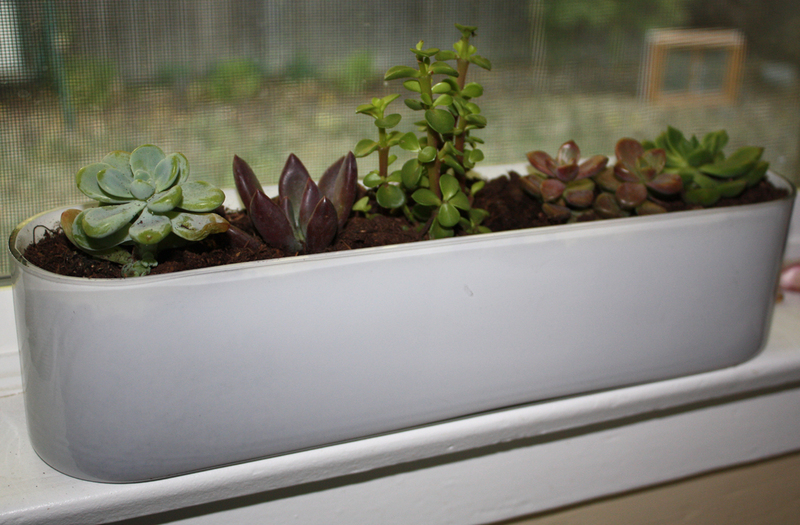 And here's a picture of our windowsill now, in all it's plant holding glory! Now I have to figure out how much to water them and hope they grow!